​I am photographer Bryan Mierau located at 101 Shawondasse Drive in Manitou Beach, Saskatchewan. Gallery Art - For Sale: I offer a wide variety of different images from and around Manitou Beach, Saskatchewan. I believe in a quality product for a good price and I use a Canadian online photo printing company which produces an exceptional product with my images. My customers love their purchases and proudly show them in their homes and offices. I have a Gallery at Manitou Beach. Location is 101 Shawondasse Drive. Just North of the Mini Golf towards the lake still at the top of the hill. Winter Months - The Gallery is view-able by appointment only. Please call or text me at 306-917-8101 to book a time to come and visit. Summer Months - Look for "Gallery Open" signage at the top of the hill, or call or text me at 306-917-8101 to book a time to come and visit. Portraits and More: Whether you come to my studio/gallery, or I come to you. I have the skills and the equipment to capture the moments you want. I like taking photos of lots of different subjects and am always committed to capturing the best photo possible and being proud of what I have to offer you. 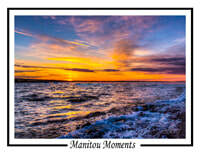 Manitou Moments 5" x 7" Greeting Cards. Standard Size Manitou Moments Post Cards. ​Manitou Springs Resort and Mineral Spa. Look for my artwork in the Water's Edge Restaurant. Something unique I have been taking Water Drop Collision Photos check them out.